It's coming! It's coming! Fire up your eBay account and get that iPad 2 listed pronto, because the iPad 3 / iPad HD is here! Details? You want details? OK! I've got details! I've got them straight from the horse's mouth, and by "horse's mouth" I mean "launch invitation, leaked case designs from no-name Chinese case firms and a whole bunch of ill-informed speculation". 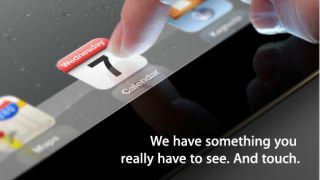 So what can we expect from the iPad 3 / iPad HD? First up, the iPad 3 display will be blurrier than Alex James' underpants. If you look at the launch invitation the Calendar app icon is nice and clear and Retina-y, but just look at the Keynote icon to the right. It's so blurry you can barely make it out. It's clear what Apple's doing here: because its Retina display is so powerful and awesome and amazing, it probably uses quite a lot of battery power. Apple's solution? Make the bits you aren't looking at go blurry to save pixels. Thinking like this is why Android can never win. Next up, there's touch. Apple even mentions it in the invitation: "And touch," it says. See? Told you. If you look at Tim Cook's hand - because it is definitely Tim Cook's, or maybe Jonathan Ive's, or Phil Schiller, or one of the other top Apple guys nobody can remember the name of, like Bert McThingy - you'll see that Apple's clearly taking multi-touch into a whole new dimension. We've had touch. We've had multi-touch. Are you thinking what I'm thinking? If you're thinking "knuckles" then you are thinking what I'm thinking: there's clearly some knuckle control going on here. Nobody outside Apple is thinking about knuckle-controlled computers, and that's why Android can never win. Last but not least, the iPad 3 won't have any buttons. The internet has decided this based on the text of the launch invitation, which says "We have something you really have to see. And touch." That, clearly, means that the iPad 3 doesn't have a home button, because "touch" means "touch the border" and "see" means "you can't see the button, because there isn't one. See?" Android fans don't indulge in this kind of speculation when there's a new Asus Transformer en route, and that's why Android can never win. I have no idea, and neither does anybody else. The Retina display looks likely, of course, but the only thing we know for certain is that that iPad 3 - if indeed it's called the iPad 3 - will have an Apple logo on it and a nice box. Speculation is fun, but it's purely speculation: while some stuff is pretty predictable - let's face it, Apple's not going to unveil a device that's like the current model but rubbish - the only people who know for sure what Tim Cook's going to show off - at least, until Apple does its traditional leak-to-the-Wall-Street-Journal thing - are the chosen few inside Apple. It's like Christmas Eve: instead of going to bed and letting Santa do his stuff, Apple fans and observers are hiding under the blankets, trying to divine from the lumps and bumps whether we're getting a shiny new bicycle and a glow in the dark Buzz Lightyear or a sack of coal. In fact, it's worse than that: while Dad's sticking a top-end skateboard under the tree we're imagining nuclear-powered hoverboards that totally fire laser beams and control robots and stuff. I suspect that whatever Tim Cook unveils, it'll be the iPhone 4S all over again: a great product that isn't quite as great as a completely imaginary one.